It's all relative(s)! : A few Frosty tales. Leicester, Knighton, Countesthorpe, Rotherby. And a non-existent Alexander Frost, the hatter. A few Frosty tales. Leicester, Knighton, Countesthorpe, Rotherby. And a non-existent Alexander Frost, the hatter. Frosts of Knighton and Countesthorpe with two Williams: which is which? I have recently been going down a few Frost rabbit-holes and burrowing around... coming up in places like Countesthorpe and Ratby and Rotherby, and becoming confused in the process. I had originally traced Sarah Frost's ancestors to her grandfather, William Frost, who was born in Knighton, Leicestershire in about 1776. His date of birth comes from the 1841 census, where the census-takers did not record the exact year of birth for the adults: the enumerator was supposed to round down to the nearest five years--but not all did. Or they rounded up. So there is a big margin of error. As he died before the next census in 1851, 1776 is just a mark in the sand. Knighton was then a village with a chapelry, St Mary Magdalene, which meant that it had parish records of its own but was part of the much larger parish of St Margaret's of Leicester. There were baptisms, marriages and burials recorded in Knighton, but some events--especially marriages--seem to have been carried out at St Margaret's church, or at least recorded there rather than in Knighton. Sarah's grandad William was from Knighton, according to his marriage, and my earlier research came up with a baptism for a William Frost, Knighton, in 1776: born to mother Mary Frost, no father named. A bit of a brick wall. This research was done several years ago and involved lots of staring at microfiche copies of parish records on a squeaky machine in a dark room in a family history research centre in the USA. Since then, more parish records have been digitised, and I recently found another William Frost, also baptised in Knighton, in 1773. Aarrgh. I cannot yet find any definitive evidence to say which of these two Williams--baptised 1773, or 1776--is the "right" William to be my great-great-great-great grandad. He could be either one. I cannot find a reliable death record or marriage record that would eliminate one or the other. So in my online tree, they are both marked with warning signs. Because I don't know which William married Mary Bryan. I just know that one of them did! 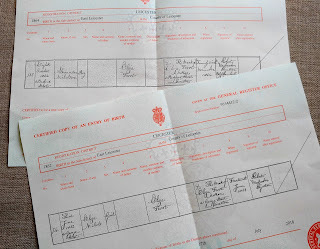 Sometimes the parish records will mention a multiple birth--I have seen "twin" next to a baptism record, sometimes with, sometimes without, the other twin's name. And once, a set of triplets, where the record showed the baptism of two children and also said that a third child had been stillborn. A vicar or clerk being respectful and helpful and kind. 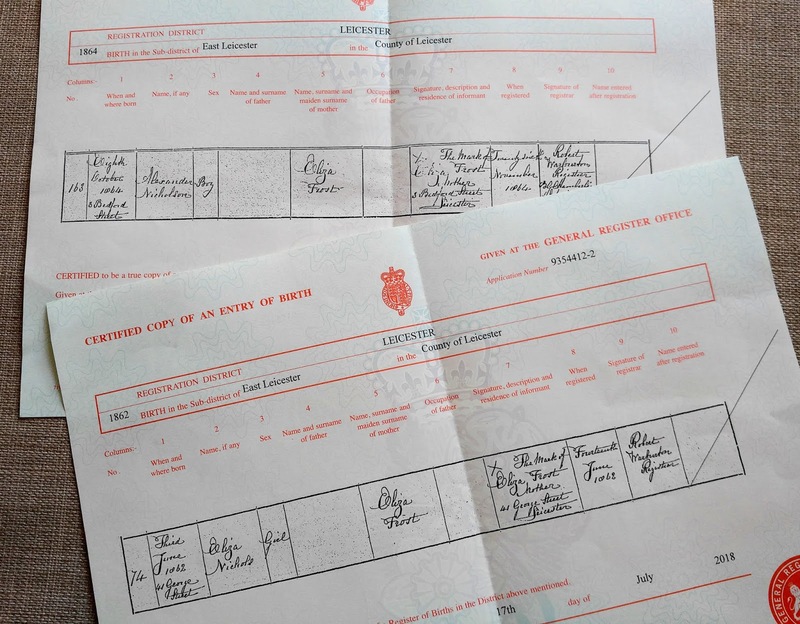 Early UK parish records only include the father's name, not the mother's. Occasionally the year, or even the exact date, of the birth itself is included with the baptism (but most often not). And then you have the very early records which simply say, John Smith baptised... and nothing else. No name of father, or mother, no age, no clue whatsoever. Could have been a newborn. Could have been a thirty-year-old who had just realised that they had never been baptised and wanted to do so before being allowed to marry. Or a ninety-year-old John Smith, preparing to meet his maker. Family history is a treasure hunt, a mystery story, a forensic investigation, and an adventure. Be prepared for sorrow, surprise and intrigue. Even if it's down a rabbit hole that ends up nowhere near your own ancestors!